Could Hungary's Toxic Flood Get Even Worse? On Oct. 4, officials in the small Hungarian village of Kolontar evacuated around 800 residents over fears that the walls of a toxic reservoir at the nearby Ajkai alumina plant were about to collapse. 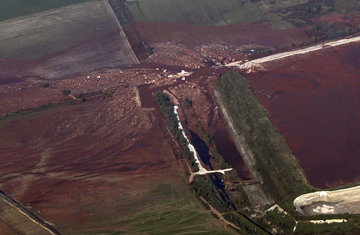 The next day, the dam burst, releasing a 6-ft.-high (2 m) wave of toxic red sludge through Kolontar and two other villages. The deadly torrent of iron oxides killed eight people, contaminated more than 2.5 million acres (1 million hectares) of farmland and seeped into the Danube. Hungary's worst-ever chemical accident has prompted a flurry of finger-pointing: the government has seized control of the mining company MAL until it compensates victims, and police briefly arrested the firm's controversial chief executive. But beyond Hungary, the spill has sounded alarm bells about the dangers posed to the Danube River basin by thousands of other contaminated sites throughout Central and Eastern Europe. "Hungary is a wake-up call," says Herwig Schuster of Greenpeace Austria. "The mining industry produces an enormous amount of waste and the inefficient way in which mining was carried out under the Soviet system has resulted in a large number of toxic deposits across the region." An E.U. report from 2004 highlighted 260 polluted sites in Hungary, and Romania's Minister of Environment recently said in a statement that Romania has "an inventory of over 1,000 contaminated sites." And those are just the ones we know about. Although communism fell in Central and Eastern Europe in 1989, the system's industrial legacy lives on. For decades, Comecon, the Soviet Union's economic-planning unit, encouraged the countries in the Danube River basin  Bulgaria, Hungary, Romania and Yugoslavia  to develop dirty mining and metallurgy industries. The communists shrouded the industry in secrecy  and even today there is a remarkable lack of information about the location of mining dumps in the region, an issue that the E.U. 's Mining Waste Directive will address. Unfortunately, those guidelines for best practice will only come into force in 2012. "The scary thing for us was that we didn't know anything about the Hungarian site," says Andreas Beckmann of the World Wildlife Fund. "How many others are out there?" Environmental groups believe that Romania could suffer the most. As Schuster of Greenpeace says: "Of all the E.U. countries, Romania has the most old burdens from the mining industry and rehabilitation works have started later than in other countries." Following the Hungarian spill, the Romanian media went into a frenzy about a red mud site at an alumina plant in Tulcea, near the Danube delta. Recognized by UNESCO as a World Heritage site, the vast area of wetlands contains more than 800 species of birds and fish unique to the region. A few miles upriver, the Tulcea plant stores over 6 million tons of caustic red mud behind an old dam made of stone, rocks and mine residue. Regional environmentalists particularly fear the use of cyanide, which miners use in large quantities to wash traces of gold out of the millions of tons of ore left behind by the gold-mining process. (To get one gram of gold, a hundred tons of ore is processed and discarded.) Although new mining projects are subject to strict E.U. environmental standards, enforcement remains a major problem in Romania. The most controversial project in the region is in the Romanian mining town of Rosia Montana, 260 miles (420 km) northwest of Bucharest. A Canadian investor plans to build a dam that will contain over 214 million tons of tailings  a toxic soup of mining waste including cyanide, water and ore. The mining company's own hazard assessment claims that the chance of a "dam break scenario" is "less than once in 100 million years." Romanians remain skeptical. They still remember the dam breach of 2000 when 20,000 tons of contaminated sludge, cyanide and heavy metals burst out of the Aurul gold-mine reservoir near Baia Mare, killing tons of fish. Ahead of the disaster, the site's Australian investors claimed it was safe to deposit large quantities of cyanide in a plastic-lined reservoir. Romanian authorities must decide if they will give Canadian investors the green light for their massive cyanide-mining project. Doing so would create new jobs  no doubt a boon for the struggling Romanian economy. But, as the region has seen too many times already, Romania must balance the promise of jobs with the less certain promise of security. Read about the eve of an HIV epidemic in Romania. See more on Romania and Russia's spying allegations.